Edgewood Real Estate Investment Trust (REIT), its trustees and its advisors strive to earn a solid return for investors while managing our properties with the utmost respect, care and efficiency. As our asset base has grown to more than $870 million, Edgewood REIT has worked hard to ensure that each shareholder is fully informed about our financial performance. Read the latest annual report for Calendar Year 2017. Stay informed of our overall performance throughout the year with our timely quarterly reports. 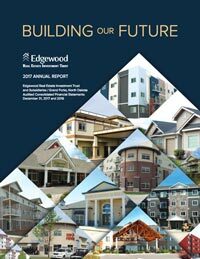 Get a quick snapshot of the financial health of Edgewood REIT.